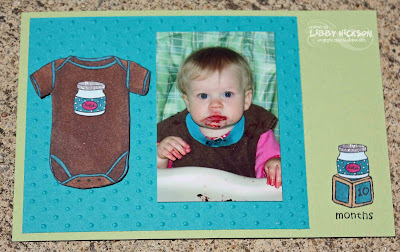 Libby's Little Addiction: From Courtney's Closet #42 - An Anniversary Celebration!! From Courtney's Closet #42 - An Anniversary Celebration!! Hello and welcome to my From Courtney's Closet one year anniversary celebration!!!! 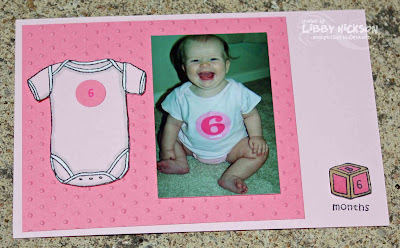 One year ago last week I posted my first outfit-inspired card, not having any idea that I'd still be doing it a year later, or that several awesome ladies would feel inspired enough to play along, and in the process become some of my best blogging buddies!! I'm so happy that it's played out the way it has. That you enjoy this challenge. And that you put up with my often erratic posting schedule! :-) I had completely meant to post this last week, on the ACTUAL one year anniversary, but I suffered from some post-vacation loss of mojo, not to mention that even though it's very simple, this ended up taking me much longer to put together than I had anticipated!! But better late than never? I hope?? For this week's challenge - you are welcome to choose ANY of the twelve months as your inspiration!! Just mention in your post which month it is, in case it's not obvious (hee hee). I will put everyone who plays into a hat and randomly draw a winner - who will receive a Wee Tees set of your very own!!! (or if you've already rushed out to buy Wee Tees, then a different Gina K set of equal value) Sound good?? You are welcome to do more than one month, I will enter you as many times as you play along. As usual I will also say who made my "favorite" card, and that person will get my featured badge for their sidebar, if they want it! 1 Month - looking at her brother in awe. This cute outfit was from my sweet friend Leslie, and actually had owls all over it - but this teddy bear is just too cute so I couldn't resist using it instead! 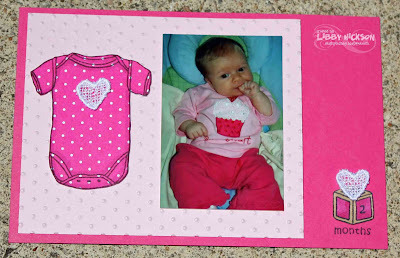 2 Months - my little Cupcake in her first of many cupcake outfits! I loved the lace "frosting" on this one! 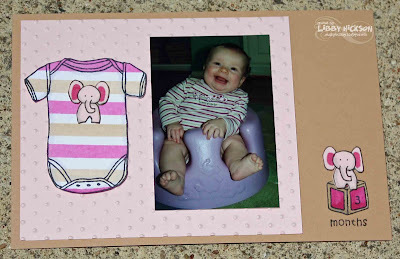 3 Months - for this onesie I drew the stripes with my markers and a ruler, and freehanded the little elephants. 4 Months - again I drew the cherries, as I'm sure you can tell!! LOL! 5 Months - sweet as a bug! 6 Months - sitting on her own, I just love that big grin!! 7 Months - enjoying the sun on a pier in Cape Cod. 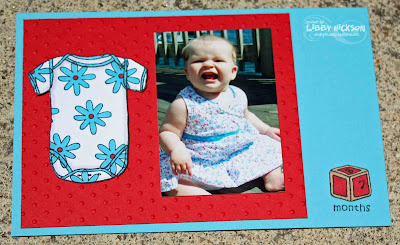 This flower is from the Stampin' Up ABC Images set, which has so many stamps that work well with Wee Tees! 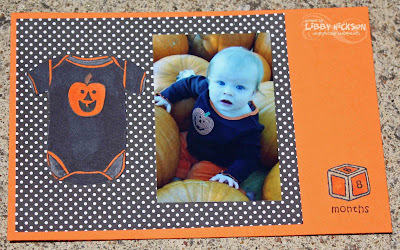 8 Months - in the pumpkin patch! Again I'm sure you can tell I drew that pumpkin! :-) 9 Months - I tried drawing a monkey, but it was Not Good. :-) So I used Changito instead. 10 Months - eating blackberries for the first time! I love her messy face, but I'm not thrilled that I had such an UGLY bib on her for this photo!! The baby food jar is also from ABC Images. 11 Months - my sweet little snow bunny!!! The bunny stamp is from Inkadinkado. 12 Months - HAPPY BIRTHDAY COURTNEY!! Again, cupcake from ABC Images. My plan is to also add some journaling about what happened each month in the empty space at the top right on each page. So there you have it!! I hope you'll play along!! I'm actually going to leave this open for another TWO WEEKS - so you have until Wednesday June 3 at 9pm CST to play along!! Happy Stamping!!! And truly, thanks for reading my blog!!! Please scroll down below Mr. Linky to see my favorite from the previous challenge!! And now... at looooong last... my favorite from Week 41, which was three weeks ago!! 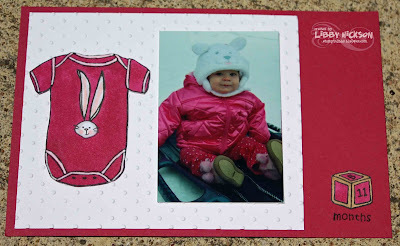 It was tough, all the cards were adorable, I debated for a while - but my favorite was this cutie from Katie Autore! It just made me smile when I looked at it, I just love that little monkey stuffing his face with that cupcake!! And since both "Cupcake" and "Little Monkey" are among the many, many nicknames I have for Courtney, I loved that too. 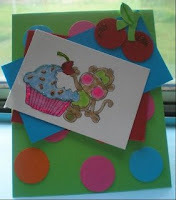 And - the cherries that Katie punched out herself, such a cute addition to the card. 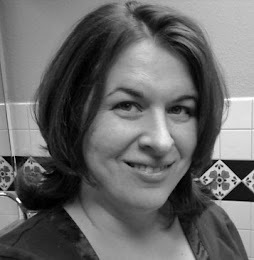 Katie is a long-time FCCC player, and I'm always so thrilled when she joins! Her and mama Anita are the coolest mother-daughter blogging team I know, I sure hope Courtney and I are like that someday! 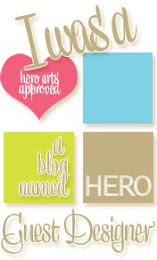 :-) Katie send me an email if you want the "featured" badge and I'll send it to you asap! And thanks everyone for playing last time! I'm confused...what am I guessing in the second contest? Which pictures have been used for an FCCC? 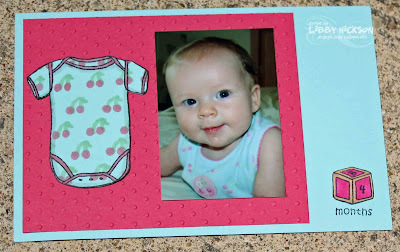 Adorable little book you are creating! I love it! what a cutie pie. My faves- month 3, month 4, month 5, month 9, month 11. OK, that is too many, but they are all so cute! Congrats Libby on Celebrating One year!! WOO-HOO!! And what a great display of all the months using Melanie's awesome wee-tees!!! That is so rockin!!! Can't wait to play along!!! Hard to pick a month - they are all so darlin!!! I love seeing the subtle changes over the months! What a doll. What a fantastic idea! It will be hard to choose one outfit! Libby, this is so inspiring! Mow I want to dig up my kids photos and do an album too! Absolutely awesome! Oh wow Libby...one of your best creations ever! 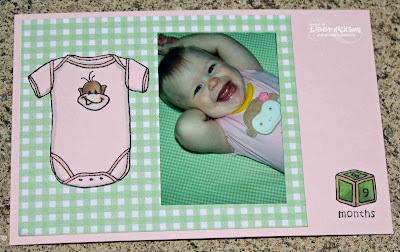 I love this idea (I just wish I had taken some similar pics of Avery with fun shirts like this!). What fun...you always do beautiful work. Keep on rockin'. O m goodness thes are all too cute!!! i screamed and scared my son when I saw the teddy bear perched atop the block, bwahhhhhhhhhhhh, it's so adorable I love it!!!!!!!!!! i ill link up your chalenge fo sho! PS your drawings are adorable!! Oh Libby! You've completely outdone yourself this time! Awesome job! 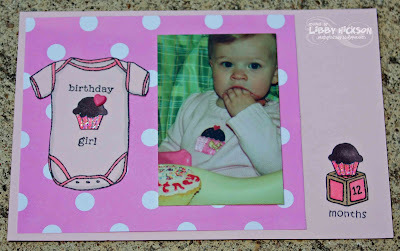 Oh my goodness...this is just the cutest idea, and you've pulled it off perfectly, Libby!! Total cuteness!! Absolutely adorable, but we never expect anything less from you! 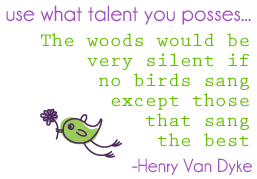 I am so behind in my challenges, I want to play....gonna try! I am lovin' that little punkin! I am so glad I stumbled across your blog and this challenge because it is totally right up my alley! Thanks again for the inspiration, Libby (and Courtney)! Happy Anniversary Libby & Courtney! Thanks again for the great challenges and all the inspiring cards you make! It just occurred to me that if Mr. Linky is not working, I should post the link to my entries here in the comments (I had posted on Mr. Linky before he broke). 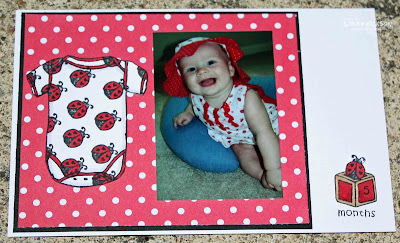 Please check out my cards here: http://sweetwishesinallyourcreations.blogspot.com/2009/05/baby-clothes-rock-n-roll.html. ...and skating in at the very last minute!!! :) Huge congrats on the 1 year anniversary! It's hard to believe how fast they grow. So glad I could help you celebrate! I managed to make a card so am here to play. I wish I had more time on my hands but what are you gonna do. Just have to make the most of what you have. You know where to find me.LOL. 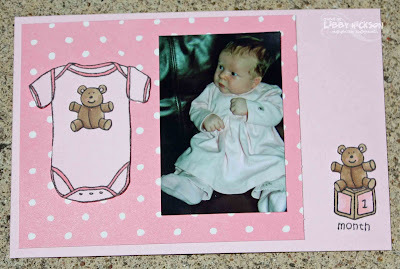 I love this idea for the first 12 months! I hope I made it in time. I'm sorry I'm such a slacker but it was tough to decide which cute picture to pick!